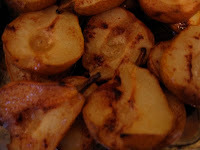 MUCH ADO ABOUT STUFFING: Honey Baked Pears like Grandma's Passover Fruit Compote but Better! Honey Baked Pears like Grandma's Passover Fruit Compote but Better! In Case you never got around to trying the wonderful Baked Pears I posted a few weeks ago, it occurred to me that those would be a wonderful, modern version of the "Compote" I dreaded as a kid when seder dessert FINALLY appeared! Of course, the usual thing is to poach pears in red wine, but this eliminates poaching, and its incredibly simple ingredients are easy on Passover requirements. Using a vegetable peeler, peel the pears, and cut them in half the long way (if you can keep the stems intact they look prettier. Taste the same). Use a teaspoon or a melon baller to scoop out seedy core. Arrange pear halves flat side down in baking pan. Pour pear nectar into pan, to the depth of about an inch, or almost to the top of the pears. Drizzle with honey, dust with spices, add optional Vanilla. Bake for about 45 minutes to an hour until the pears are soft, and the liquid is reduced to a thick syrup. 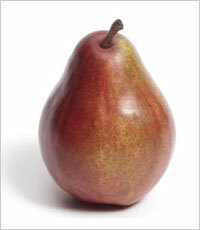 Or, refrigerate pears and syrup until you need them or keep them warm in a warming draw, or rewarm before serving. These are delicious as they are, or you can pimp them with anything you love. Crumpled Macaroons would be a natural, Or honey cake crumbs. Ginger and pears are a natural, so think of doing them with ginger snaps, ginger bread. Creme Fraiche. Or ice cream.